When students in Bruce Davis’s class graduate from Halls High School, they have both the soft skills and some practical skills to immediately enter the work force. Davis teaches a three-year Skills USA class. It’s part of a national program that partners students, teachers and industry to ensure America has a skilled workforce. Nationally, about 390,000 students from middle school to college are enrolled each year. The emphasis at Halls High School is on carpentry and learning how to use wood tools in partnership with Marvin Windows and Doors, which manufactures premier windows and doors. Skills USA took the place of the VICA program a few years ago, Davis said. During the first year of the three-year program at Halls High School, students learn soft skills, such as what makes a good employee, how to apply for jobs and how to safely use carpentry/wood tools, Davis said. The next two years, as they sharpen their carpentry skills, they’re earning dual enrollment credit for high school and also for a production technology certificate from the Tennessee College of Applied Technology. Marvin Windows and Doors invites each of them to interview for a job at the plant right after graduation. In the program’s seven years, Marvin Windows and Doors has hired about 16 to 18 of his students, Davis said. Other graduates of his program go on to college or other technical schools armed with the knowledge that they can successfully accomplish what they want to do. 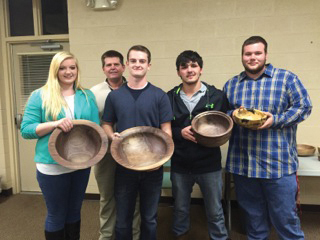 Students in the class learn how to make objects with wood. Besides working on projects for themselves, friends and family members, they’ve also completed projects throughout the community. This includes benches for the Lauderdale County Fair, a 20- by 30-foot pergola and outdoor classroom at Halls High School, a 24- by 30-foot garage to store lawn mowers and other equipment, a front porch on the FFA barn and a 16- by 20-foot covered pavilion outside the gym for cooking during basketball season. They partnered with Cole Harris, an Eagle Scout, to build a 12- by 30-foot pavilion at Halls City Park. One of the students’ favorite projects was making wooden snowmen for the high school’s special needs students. 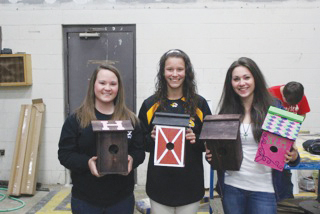 In conjunction with the Ada Nixon Book Club, students built a Little Library for downtown Ripley and are building a second Little Library for the City of Halls. A Little Library provides a public space for people to access books they want to read and drop off other books once read. The Skills USA students are involved in the entire process, from drawing up the project’s specs, to getting the materials, to completing the construction, Davis said. Many parents are working more than one job these days and don’t have the time to teach their children how to use their hands, Davis said. Davis learned the skills he’s teaching by working with his father to custom build and remodel homes. He was volunteering with the school when the school had an opening to teach the Skills USA classes.